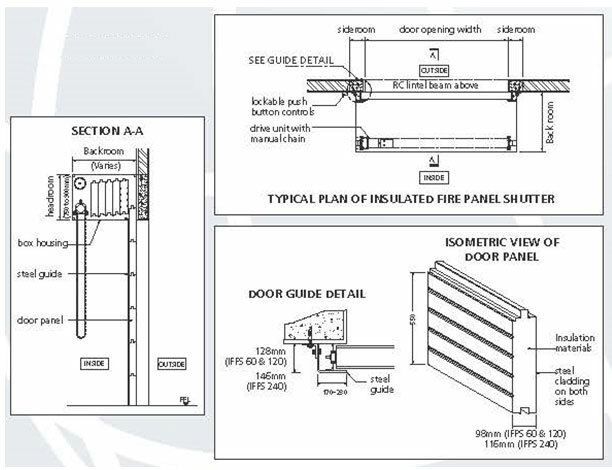 A conventional fire insulated shutter design comprise of two layers of shutter curtain with an air-gap in between, resulting in a fairly thick curtain panel that occupies valuable space. The shutter curtains are usually made of fabrics, insulation blankets or a fabric/steel slat combo and are not suitable for frequent door operation. 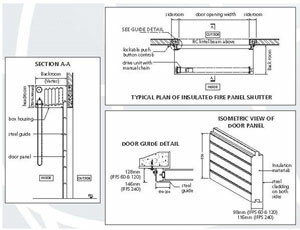 The GLIDEROL Insulated Fire Panel Shutter is a departure from the norm. It is an upward acting door system consisting of a series of door panels that stack vertically one on top of the other when the shutter is in the closed position. In the opening sequence, the panels are lifted upwards, detach from each other upon reaching the top of the guides and then collected in the door console to stack face-to-face behind the lintel. The door curtain is a single layer solid steel-cladded panel design with no hinges, air gaps or exposed fabric material. Its space-saving panel thickness of 98mm or 116mm (IFPS 240) is substantially thinner than most other such products that are currently available. They are of steel construction, weather resistant and has a high wind load capability. With these features, the IFPS can also serve as a security shutter for daily use, for internal or external applications. IFPS 240 offers 240 minutes of integrity with 240 minutes of fire insulation. Suitably sized steel hollow sections forming a rectangular perimeter frame and stiffened by vertical intermediate members spaced at not exceeding 1000mm apart. The horizontal edges of each frame are designed to interlock with the adjacent panels in a continuous tongue & groove joint such that when stacked one on top of another in the closed position, they will collectively form a rigid vertical barrier. Attached to each of ends of the framing are rollers and fittings that are designed to accept and work with the operating mechanism. Fire resistant boards are secured unto both faces of the frame and finished with roll-formed galvanized steel claddings. Sandwiched between these boards is a wadding of non-combustible and non-toxic insulation materials, without any exposed fabric material or air gap. The door console is located at the top of the door and installed behind the lintel. It houses the door panels when they are lifted up. The Head Plates forming the two ends of the door console are fitted with the chain & sprocket arrangements that form the operating mechanism of the shutter. The door console shall be covered on all three sides with 1.0mm thick galvanized steel cladding secured to steel framings and lined internally with insulation materials. The base of the bottom panel shall be reinforced to serve as the bottom rail and may be fitted with a continuous pliable weather seal. A pliable bottom weather seal is available as an option. The weather seal was fire tested together with the shutter specimen and did not compromise the performance of the shutter. The door guides are a pair of suitably sized channels fabricated from 8mm thick steel material. The guides are attached to a continuous 75mm x 75mm x 6mm thick steel wall angle that extends to the Head Plates. The drive unit shall consist of a suitably-sized motor operator mounted within or below the door console. It shall have an integrated gearbox and a chain-operated sheave wheel for manual operation in case of power outage. The hand chain shall be located away from the opening and held at the side by a chain holder, ready for use. The control box shall be lockable, housing a set of push buttons for Up’, ‘Down’ and ‘Stop’ operations. The door operation shall automatically stop at the desired upper and lower limits via adjustable limit switches. For safety reasons, the ‘DOWN’ button shall require the operator to push and hold when closing the shutter. This is to ensure the closing operation is being supervised. Upon sighting an obstruction, the operator will instinctively release the push button by reflex. This will instantly stop the downward travel of the shutter and prevent accidents. Power supply shall be either Single Phase 230V x 15amp or 3 Phase 415V x 20amp, depending on the size of the shutter.